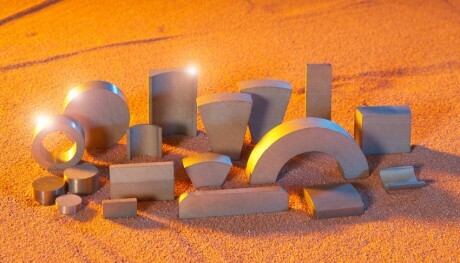 SmCo magnets pertain, just like Neodymium-Ferro-Boron (Neoflux®) magnets, to the rare earth magnets. SmCo magnets have excellent magnetic characteristics with a maximum energy product of 18 to 30 MGOe, a low temperature coefficient and a high stability. Moreover they are very resistant to oxidation and require no coating under normal circumstances. SmCo magnets are the best choice, especially for applications where durability is of great importance. Think about advanced electronic products, medical equipment and the automotive industry. The maximum usage temperature is approx. 300˚C. Pressed out of rare earth materials Sm-Co. Provide maximum magnetic force, even with very small dimensions. Temperature range: standard up to +250 °C. Remanence Normal coercivity Intrinsic coercivity Max. energy product Max. operating temp. Reversible temp.coeff.